Glasgow-based company Centri-Force Engineering supply and maintain new and refurbished decanter centrifuges, homogenisers, separators, auxiliary equipment and spare parts to the Process Industry. Over recent years they have seen a gradual shift in the application of their products, with environmental issues coming to the fore. To reflect this, their existing website needed updating, and a fresh new design to better represent the change in market sector and application was required. The new website has been built on the Sitefinity content management system (CMS), giving Centri-Force web administrators full administrative control of their web site and an extremely powerful and flexible means of editing and adding to their web content. Design and templates were created by WyeTec and loaded into a private version of the new Sitefinity-based website, along with some initial web content. Centri-Force personnel were then able to complete the site population, with guidance and assistance from WyeTec where necessary, ready for launching the site. 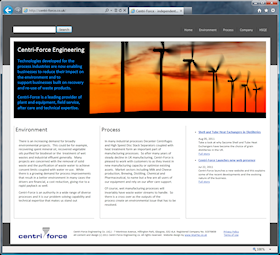 The New Centri-Force content managed website features a clean, modern design that reflects the company’s position in the marketplace, and the environmental emphasis on its current business activities. With the site live and generating new traffic and enquiries, the Sitefinity Content Management System allows relatively non-technical personnel to update web content with ease. Importantly, it allows them to update the site regularly, showcasing new products, special offers, and providing press releases. By updating the content on a regular basis and thus keeping the site 'live', both visitor and search engine interest is maintained. Integration with the company’s Google Analytics and Google Adwords accounts gives visibility of the site, and advertising, performance. Left: The Sitefinity Content Management System (CMS) gives Centri-Force personnel total control over the website content, empowering them with the ability and flexibility to update the site themselves whenever they wish. To get the best results from the powerful SiteFinity CMS, the site is hosted on one of WyeTec's fast and reliable low-contention dedicated servers. 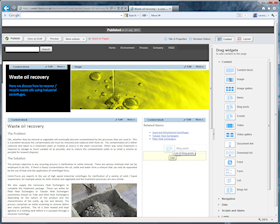 Contact WyeTec today to see how a Sitefinity Content Management System can benefit your organisation.